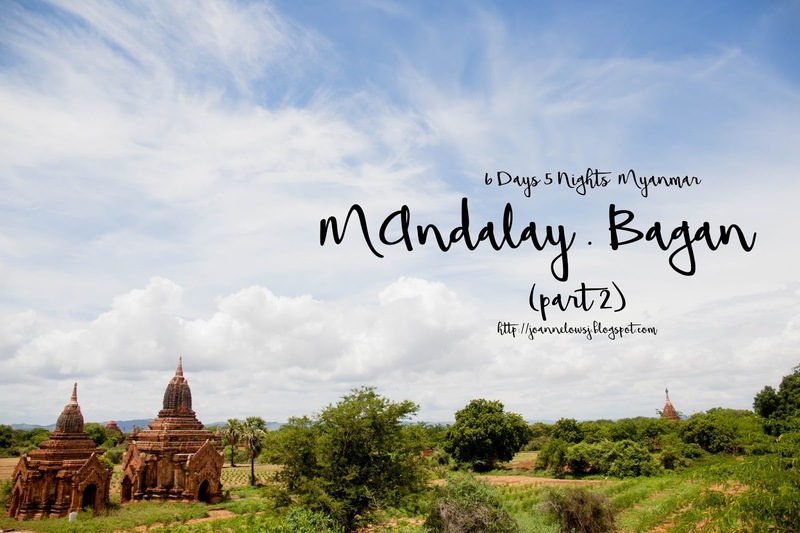 3 hours away from Mandalay, Bagan is home to 2000 pagodas. 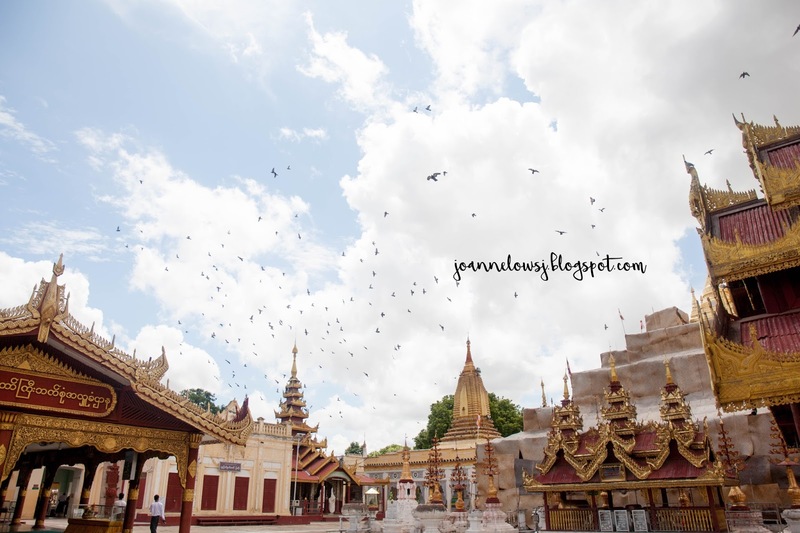 Other than being the first kingdom to unify all-region in Myanmar, many had come to visit the world's largest and densest concentration of Buddhist temples in the world. 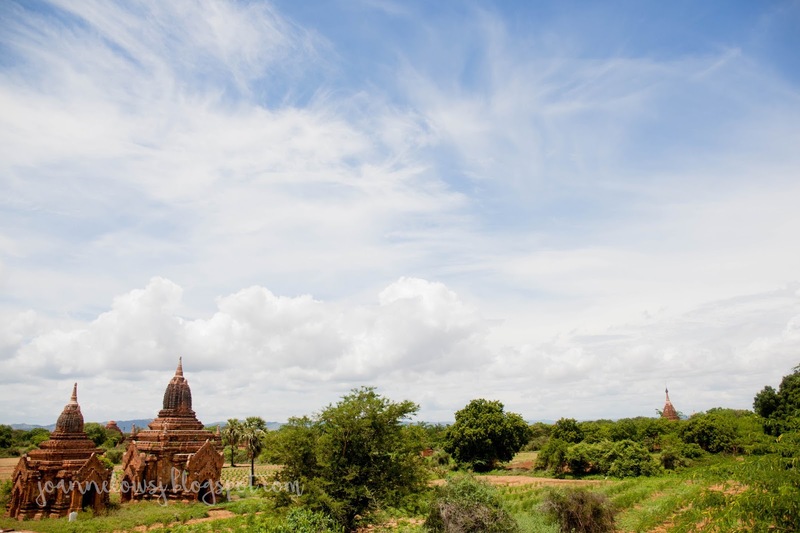 H & I spent 3 days in the city of Bagan Archeological Zone and surround ourselves in the Burmese culture. 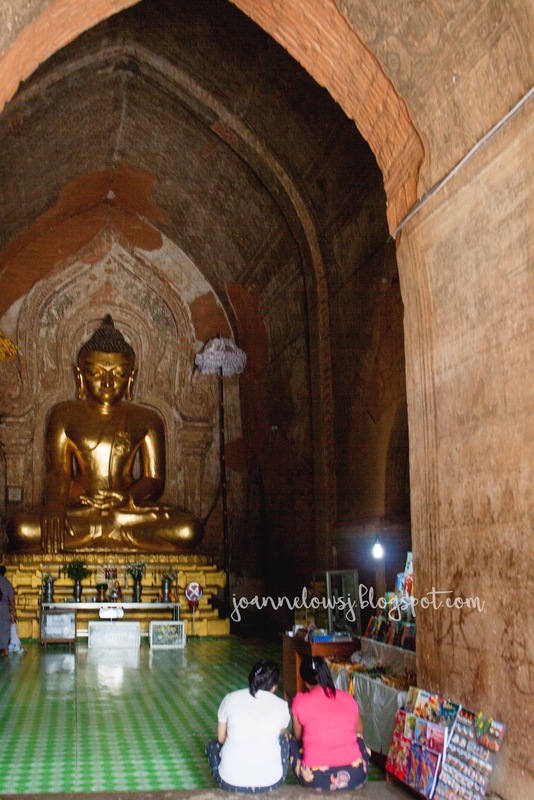 As we continued our trip from Mandalay to Bagan, We bought tickets from OK mini-bus to Bagan. 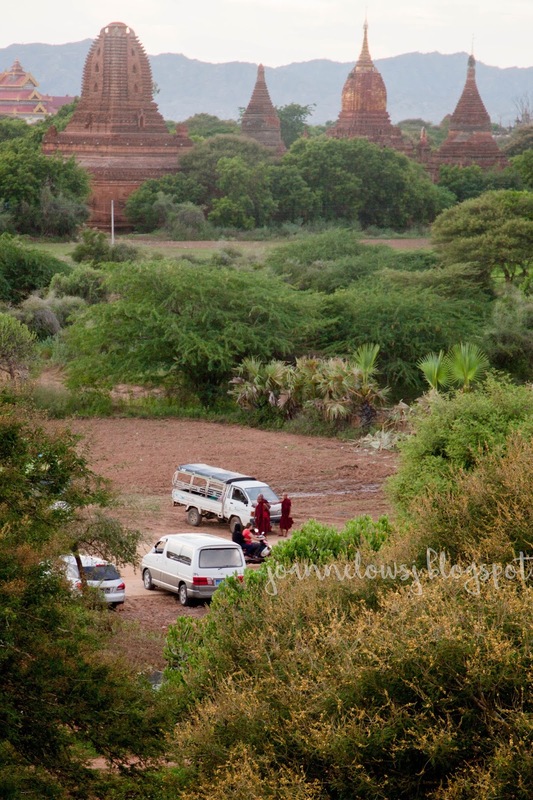 The journey to Bagan took us 4 hours with 1 break in between. Depends on your luck, the condition of the mini-bus can be good and bad. We were not too lucky that day and got a mini-bus with faulty air condition. Personally, I like the door to door hotel drop off service the company provides. 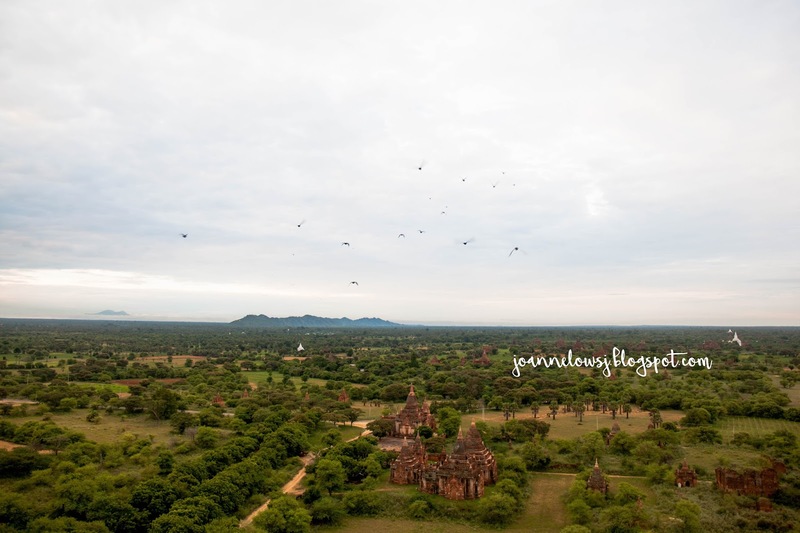 However, while we were there in Bagan, the driver who dropped us at the hotel in Bagan told us that the drop-off was only available to Nyuang-U and not at Old Bagan. He asked us to give him extra and so we give him 5000k. Ironically, when we were at Aureum Palace hotel & Hotel we managed to book a door to door bus transportation back to Mandalay without having to pay extra. Hmmm. 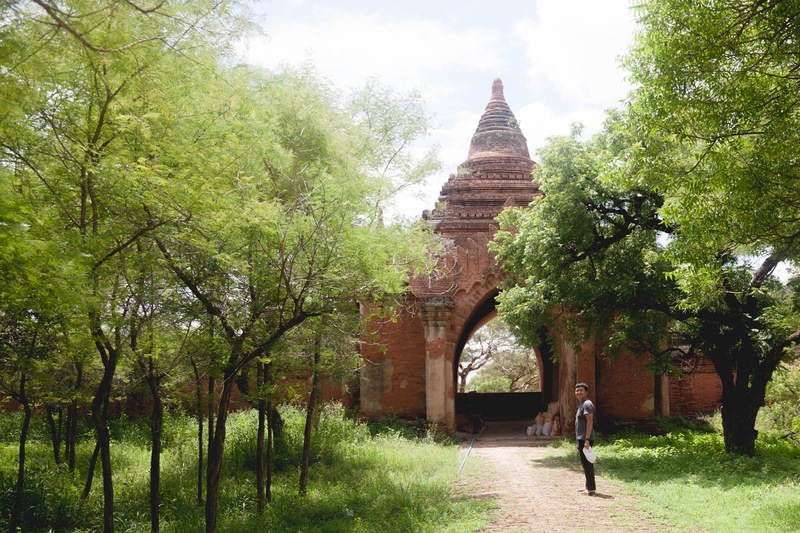 Upon entering the Bagan Archaeological Zone, we were asked to pay a 25,000 visitor fee. The ticket is valid for five days and we are required to carry the ticket with us all time. Since travelling out to Nyuang-U is pretty far and we are burned out with the bus ride in the morning, we decided to have dinner in the hotel. 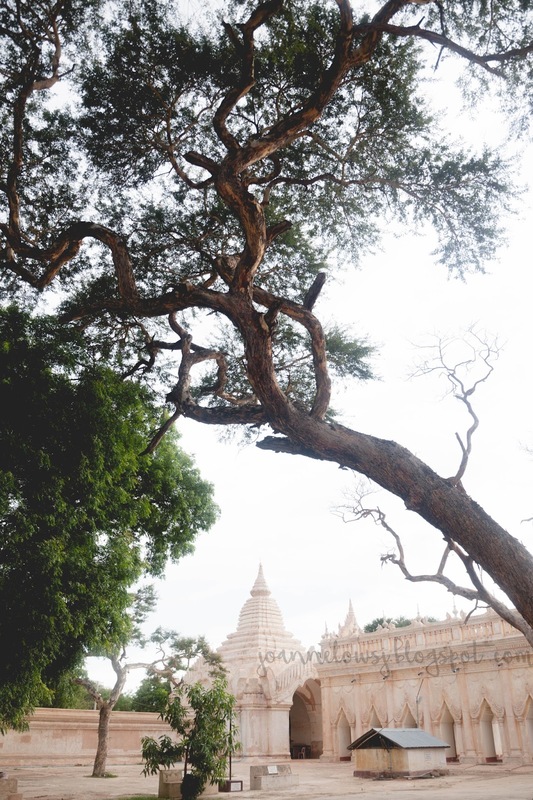 Sadly it was already pitch dark when we arrived at the highest viewing point in Bagan. Dinner in the restaurant is alright. The pork burger I had was pretty good! Plus, they gave generous serving! Tip: Go to the top viewing deck for sunset! Initially, we wanted to hire a car to get us around as it was easy and convenient. However, H wanted to add more fun. So we decide to go with E-Bike. It was our first time in e-bike and it was a little tricky at first. Thankfully, H mastered it and we travelled around in our little bumble bee with ease. A map and GPS in hand, we set off to the kingdom of Pagoda after breakfast. Ebike rental fee from Aureum Palace is 8000k for 4 hours and 15000k for 8 hours. Ideally, we should rent directly from the e-bike shop. However, Aureum Palace Hotel & Resort is located in Old Bagan, travelling out to rent the e-bike will cost more. Thus we rented 4 hours each session (9 – 1pm), Late afternoon (4pm – 8pm) with a few hours of break in between. So glad we go ahead with this arrangement because the weather was very humid. Situated in the village of Minnanthu, Sulamani Temple is the first temple we visited. Built in 1183, the temple had a symmetrical structure with 4 entrance that was linked together. 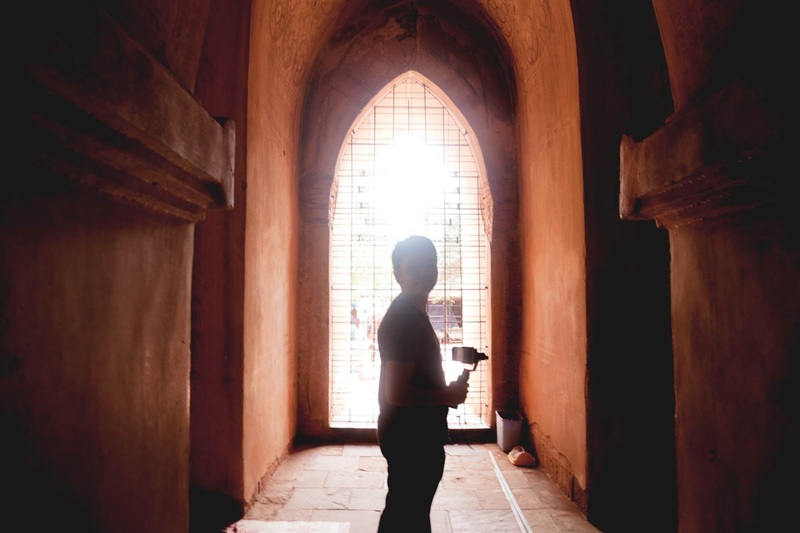 Considering the temple was built in 1183, the temple had awed many. Unfortunately, due to the earthquake in 2016, many temples and pagoda had to undergo reconstruction. The temple, name after King Htilominlo, was three-story high. Built in 1218, the temple had a unique structure. It was originally plastered with white stucco and were carved with mythological animals. Besides, the temple is set on a low platform and had a symmetrical floor plan. Although this temple did not interest me as much as others, observing devotees spends their time there made me think of how strong faith can be. 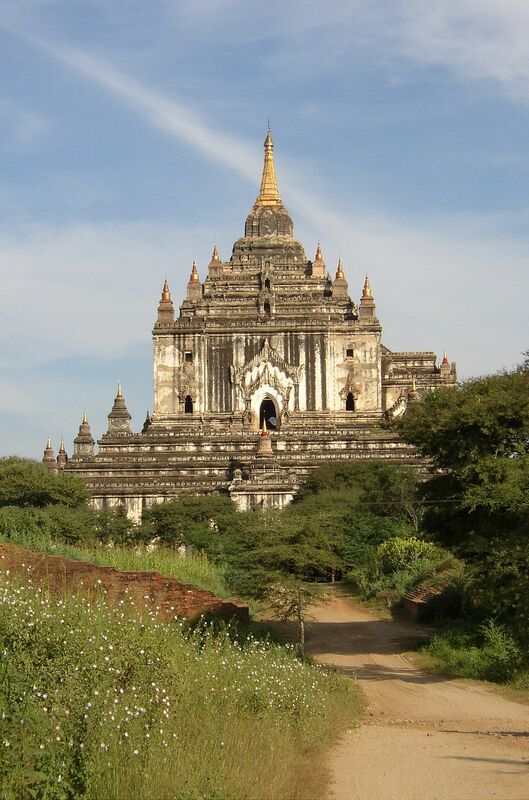 Located in the north-east of Old Bagan, Gubyaukgyi temple’s architecture was influenced by the Mahabodhi Indian temple. 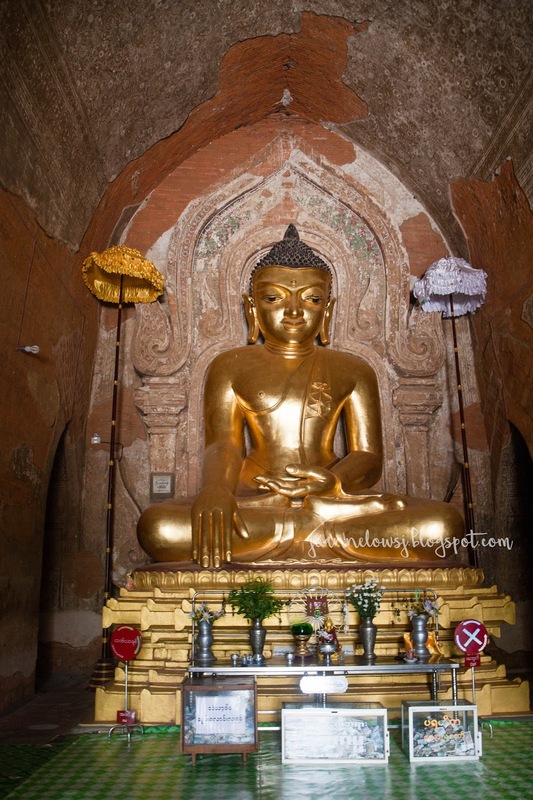 Built in the early 12th century, the temple was one of the earliest temple built. Also, there were interior walls and ceilings decorated with ancient mural paintings. Tip: The local shared with us one of the best spots to view Thatbyinnyu temple. Head out to one of the exits and there is small pagoda that allows you to go in. You can a good view of Thatbyinnyu temple from there. 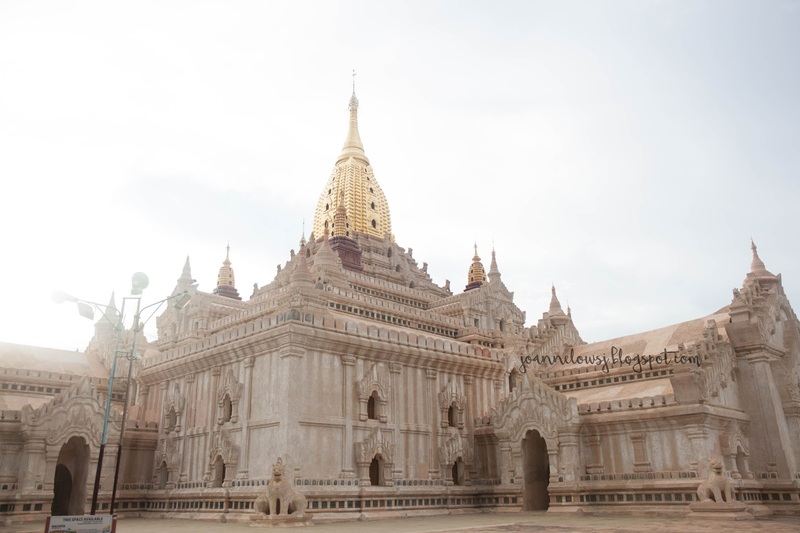 Shwezigon pagoda is one of the oldest Pagoda in Bagan. 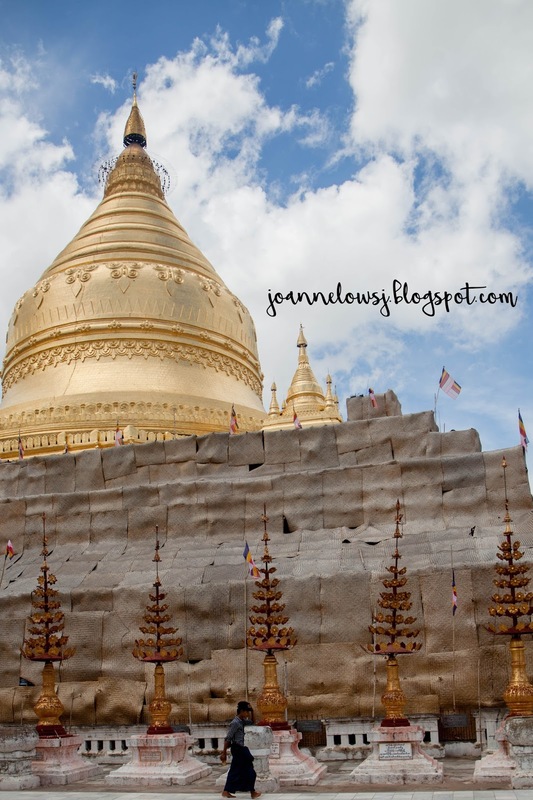 Build in 1090, the pagoda was plated with gold. 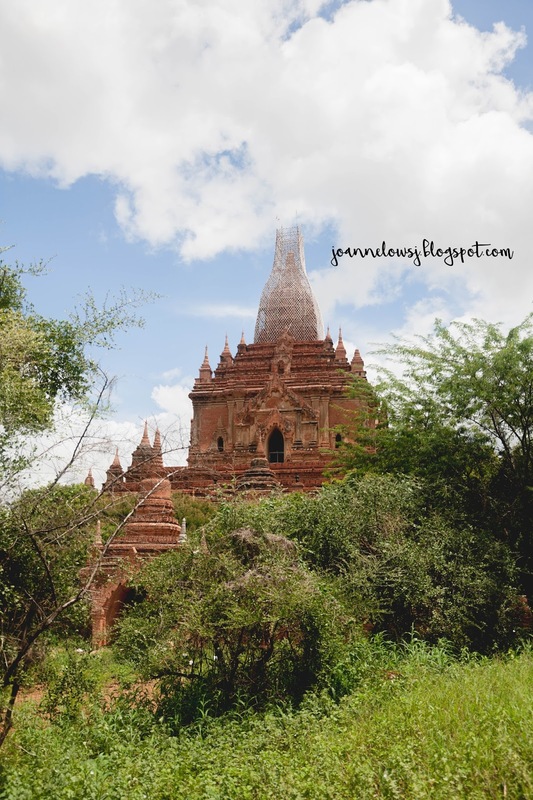 With huge gold-plated pagoda glimmering in the sun, Shwezigon pagoda is definitely the most impressive monuments in Bagan. 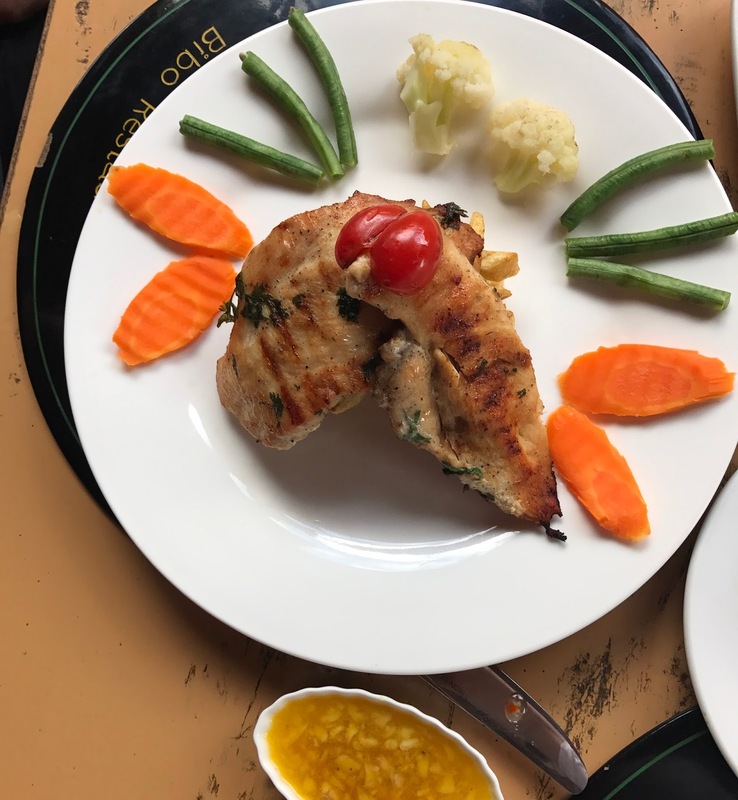 Lunch was spent in Bibo restaurant – a highly-rated restaurant in Bagan. The ambience was nice and the restaurant felt cosy. To my surprise, we were the only customer in the restaurant. So we had the attention we all need. Feeling famished, we order a table of food. Tea Salad (2500), Spring roll (2000), fish curry (3800) and grilled chicken (6500) to share. The Tea salad caught our attention and was surprisingly good. The Tea Salad aka Laphet is a combination of fermented tea leaves, chopped peanut, tomatoes, garlic cloves, sesame and cabbage. Although it had a similar taste to Thai salad, the Laphet makes the difference. It is addictive and had a combination of sweet, sour and salty taste. Definitely one of my favourite Burmese food. The rest of the dishes are pretty mediocre. Skip the grilled chicken, we find it too dry. The sauce had a funny taste too. Ananda temple was H’s and my personal favourite. 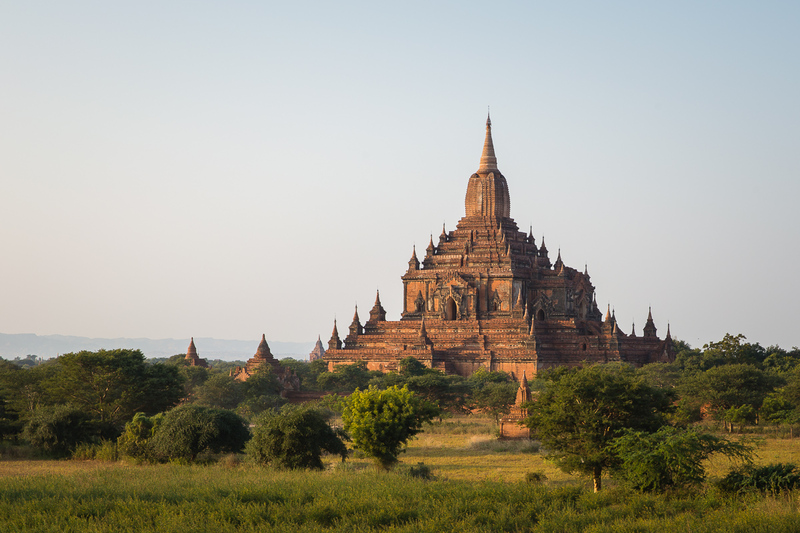 The temple is one of Bagan’s best known and popular temple. The architectural style was influenced by North Indian culture and had a distinctive feature such as spire on top of the pagoda. Perhaps due to the grand yet cosy ambience, H & I spent more time in Ananda temple. We sat around and watch devotees pass by. Built in 12 century A.D, Thatbyinnyu temple had a grand architecture. There are a lot of small Buddha figures inside the temple. Built at a height of 61 meters, the temple has a distinctive white and grey design. Although similar to Ananda Temple, this place has its own charm. Shwe San Daw pagoda also known as Ganesh pagoda had a bell-shaped stupa situated on a base of five square receding terraces. The five corners of the pagoda were adorned with Hindu’s deities. Thus, the name Ganesh pagoda came about. 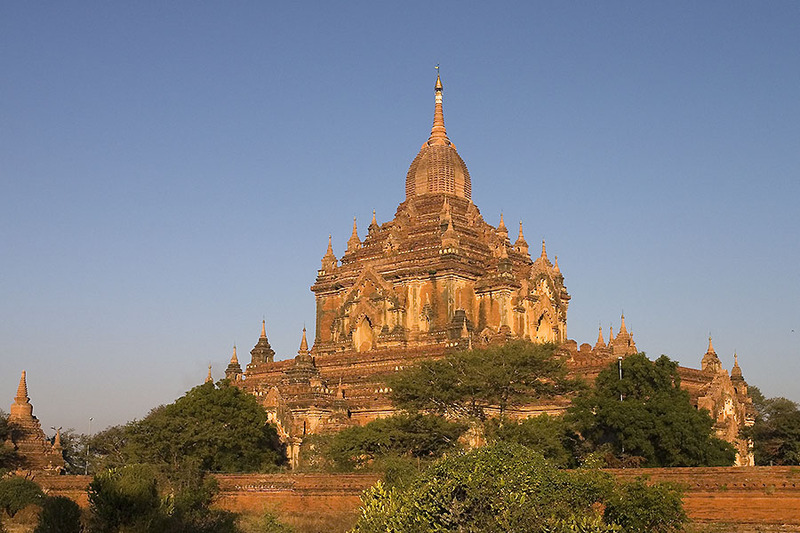 Built in 1057, at 328 feet high, Shwe San Daw Pagoda is one of the tallest pagodas in Bagan. Tip: One of the best place to view sunset here! Be there early and grab your seats! Since the trip to Melbourne, where H coincidentally found the best pizza he had, our quest to find the best Pizza in every country we visit begins. Ranked #8 in trip advisor, La pizza became our choice. La Pizza serves great wood-fired pizza. With a thin base and fresh ingredient, this pizza is perfectly baked. Although I feel that the bacon is a little salty but it goes really well with the crust. For 9400k, this pizza is a good deal. 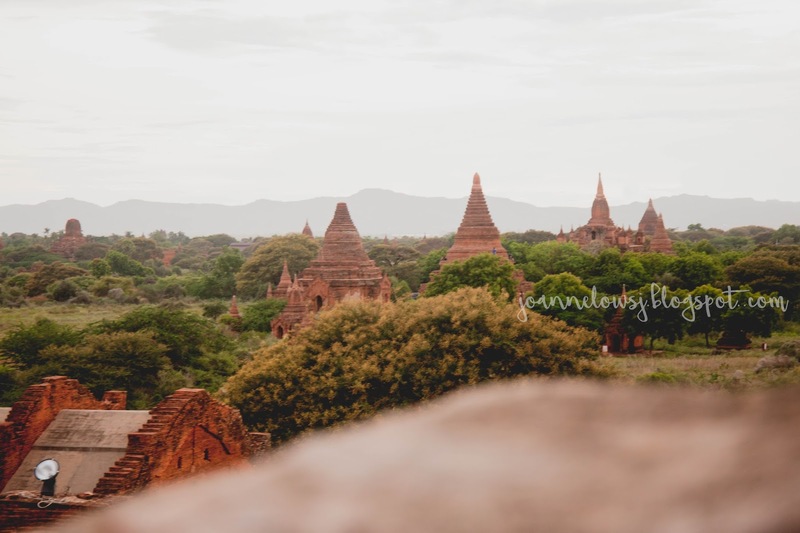 Our last day in Myanmar was spent in Mandalay city. After we checked into Bagan King, we went to Mingalarba restaurant for lunch. Since we hardly had any Burmese food (We both thought that Burmese food is not to our liking since the Yangon trip), we thought of going to one before heading back. At Mingalabar restaurant, they gave free appetizers. We ordered Samosa (2000k), Tiger Prawn(7000) and Curry(4500) to share. I love the Samosa! Unlike the usual samosa I had (mashed potato), there were many small pieces of potato. The Tiger prawn was pretty good too. However, there are only 2 pcs and cost around 7000k. The curry was a little oily (Burmese style). 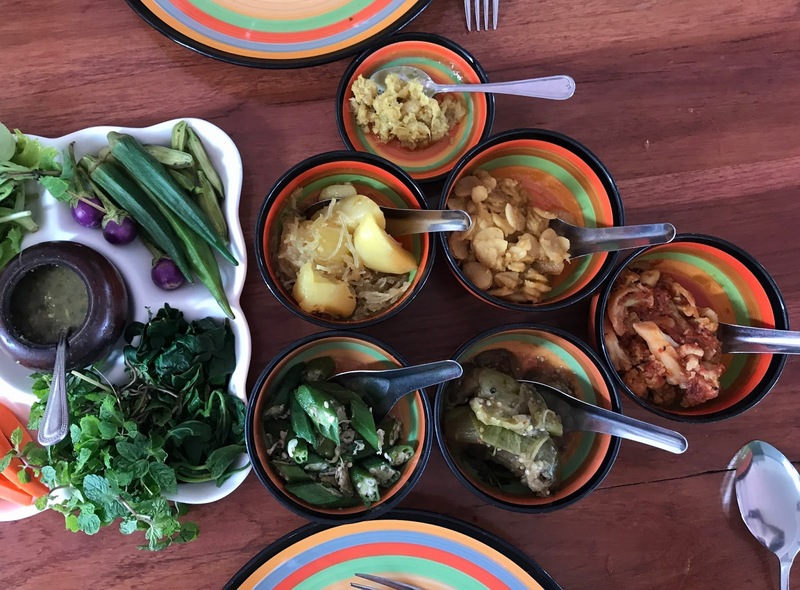 Overall if you would like to try the Burmese food, I would recommend Mingalabar restaurant. 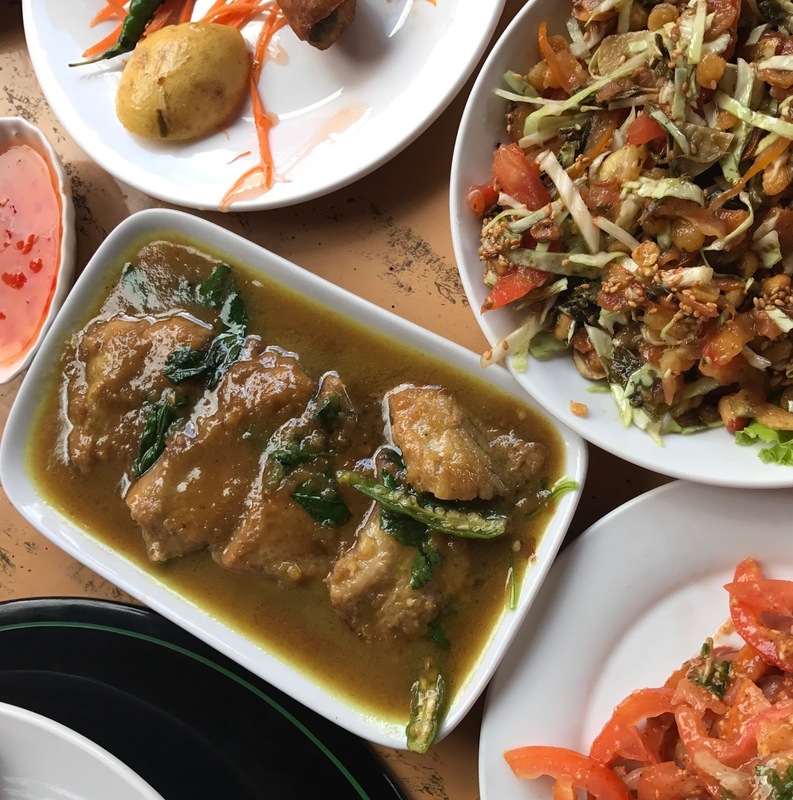 Although not the best, the restaurant is clean and offers a wide range of Burmese food for first-timer to try. We had a chat with the owner and she was very friendly. She shared with us her stories and gave us some tip to get around. I love meeting people on trips like because it made the overall experience more unique and personal. As Bagan King hotel offers free bicycle for rent, We borrowed any cycled to our dinner place – Hana Yakiniku. We ordered the pork platter(10,000), Miso Butabara (3500), Shiitake(1500), Enoki with butter(1500), Teriyaki Tori (3000) to conclude our last night in Myanmar. Although a little pricey and small serve size, the pork platter allows us to try what we like. Personally i prefer the Miso Butabara, so we ordered another serving to share. As we remise on our trips and how we met first met each other in Yangon, I thank him for coming into my life and the endless support he gave. Glad that H & I made Myanmar the last trip before we moved on to the next stage of life. Truly blessed.